Contest Rules: All artist are welcome to submit their designs for our first mural on Marmion Way. The winning design will be premitted through the City of LA and be a registered work in the City Inventory of Art. Artist must be available for the permitting process and present their winning design to the Cultural Affairs Department on Thursday February 21, 2013. 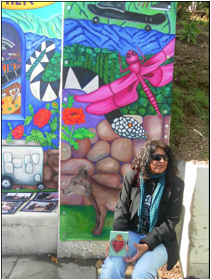 Mural will be enlarged and painted with the community under the guidance of muralist Pola Lopez. Theme: Faces and History of Highland Park – Past, Present, Future.